When you’re looking for local Pahrump restaurants, you’re going to be faced with dozens of choices. Not only that, but you’ll have to decide what kind of cuisine will crush your craving. And if you’re in a group? Good luck picking a place! At Tony’s Grill in Pahrump, we have something to make everyone happy with our local fusion cuisine. If you want Mexican food, Chinese, American, or Italian, we have all your favorites! Needing an early-morning breakfast? We’ve got that, too! Come to Tony’s Grill today and get the best fusion cuisine in the area. 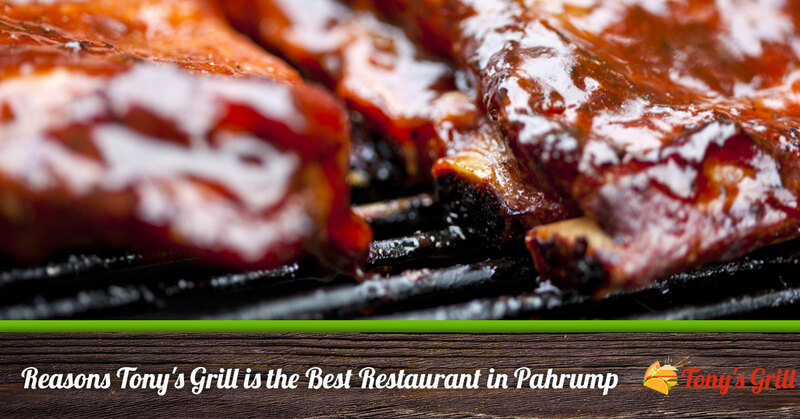 Here are just some of the reasons we’re the best restaurant in Pahrump. Everyone wants to know where their food came from, and with Tony’s there’s no question. We cook with only the freshest local ingredients we can get our hands on, making sure that you are only getting the most delicious dishes possible! We take pride in our friendly service. We want everyone to leave happy and tell their friends, “Tony’s Grill is our favorite restaurant in Pahrump!” It fills us with pride when our customers leave with full bellies and smiling faces, so we always go the extra mile to ensure a happy experience. Need we say more? We have some of the meatiest, juiciest hamburgers with classic recipes. When it comes to American fare, you just can’t go wrong with a burger. And if a ‘dog is more your style, we serve up a giant hot dog with plenty of fixings! Everybody’s favorite comfort food has to be pasta, and we’ve got plenty of options. Go with a classic like spaghetti and meatballs, lasagna, or grilled chicken alfredo. Or try one of our delicious chicken breast dishes, which are chicken marsala and chicken parmesan. Leave with your heart and your belly full at Tony’s. Ever wake up off to a rough start? We know how that goes! Instead of trying to put together a quick breakfast at home, come to us, where we can whip up eggs your way, pancakes and waffles, omelets, or even country fried steak. And of course coffee. You can’t start the day without your coffee! Breakfast places in Pahrump just got better with Tony’s. Don’t worry about packing your lunch for work. We have sandwiches with freshly baked breads, and all the recipes you crave. We have all your favorites, such as a BLT, Philly cheese steak, French dip, and, of course, grilled cheese. Vegas is famous for its steaks, but we’re going to put Pahrump on the map with Tony’s steaks. Try our New York or rib-eye, both cooked to your preference and served up with plenty of hearty side dishes. You’ll think we make the best steak in Pahrump when you sit down to one of ours. These are only a handful of the reasons Tony’s Grill will be your favorite Pahrump restaurant. Stop by our location at 2610 North Blagg Road today!